We've looked at a few small network monitoring solutions over the years, including the now defunct Cisco OnPlus, Belkin Pulse and Domotz' "DIY". All required subscription fees and were suited more for small business users and VARs, not consumers. In this review, we're going to look at Fing's new Fingbox, which the company describes as a "simple plug & play device to secure and troubleshoot your home network". Fingbox first appeared as a subscription cloud service, which we reviewed back in 2012. Overlook Soft created the original Fingbox and also created the popular, free Fing iOS and Android apps. In May 2016, Domotz acquired Fing, which grew so much it was recently spun out into a separate company, Fing LTD. Fing LTD is based in Ireland and is the maker of this new incarnation of Fingbox, the original Fing apps and FingKit device scanning and recognition technology for OEMs and developers. Fingbox originally launched on Indiegogo last November, getting 14,000 backers and raising $1.1 M. It started shipping in August of this year. The free Fing app for ioS and Android devices will scan your network and identify all connected devices, both wired and wireless. The app also port scans to detect security vulnerabilities, pings devices to verify they're on line, can perform Wake-on-LAN (WoL) to power on WoL-enabled devices and sends alerts when new devices connect to the network. Fing is one of my go-to apps and I've written about using it for network management. With the Fing app and a Fingbox on your network, you get all the features of the app, plus bandwidth analysis, internet speed testing, Wi-Fi speed testing, device blocking, internet security check, security alerts and an interesting feature called "Digital Fence". 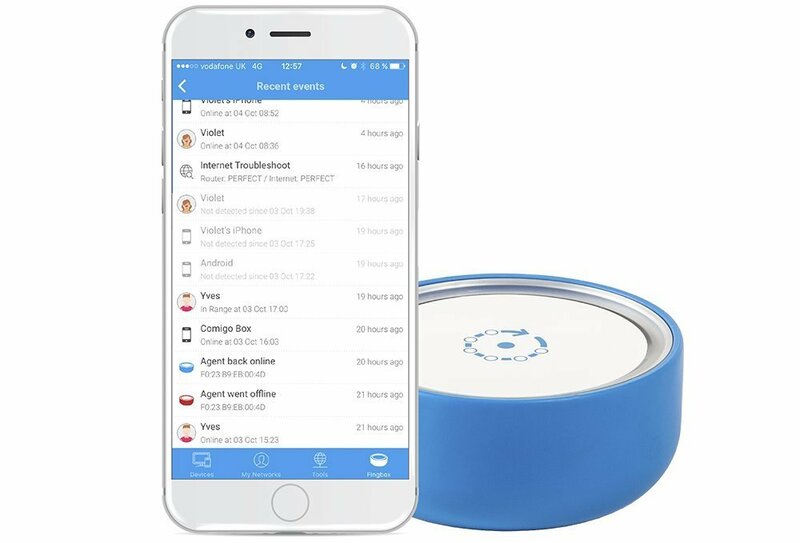 Fingbox also enables the ability to monitor your network from anywhere; the Fing app alone must be directly connected to your LAN. The Fingbox is a simple device. It is a plastic white and blue circular device a little bigger than a hockey puck and fits inside a provided blue plastic case. The assembled Fingbox measures approximately 4" in diameter and a shade under 2" high. It has a single Ethernet port and a mini USB power port. Installing it is also simple. Just connect the Fingbox to power and to an Ethernet port on your router with the provided Ethernet cable as shown in the below diagram from Fing's website. Fingbox communicates primarily via its app, but you can also have alerts emailed to you. Adding a Fingbox to your network enables the app's Fingbox icon, which provides access to the Dashboard shown below. Like CUJO, Fingbox also uses LEDs on the device itself for at-a-glance status indication. While the intent here is nice, the combinations of color, pattern and motion are unlikely to be remembered by those of us with less than eidetic memories. Fortunately, the app sets the brightness level, which includes 0% (Off). Once Fingbox is connected, install the free Fing app on your smartphone or tablet and create an account. The Fing app will find the Fingbox on your network and enable the Fingbox features. From there, the Fingbox will scan your network for detected devices. Once a device is detected on your network, Fingbox will notify you with a message to your smartphone and an email, such as the message below. The Fingbox device detection feature is useful, but as a security feature, it is limited. It simply notifies you when a device connects to your network; it is up to you to block or let that device remain on your network. Fing will detect the device's IP and MAC addresses, its operating system and host name. To better manage devices in the Fing app, you can name them, assign them to network users, add notes and enter their location as shown below. A useful Fingbox feature is creating users and assigning devices to users. In a household with children, the Fingbox can come in handy by assigning the child a username, assigning the child's devices to their username and then using the Parental Control feature to enable/disable Internet access for that user. I'll cover this capabilty shortly.